Tori Spelling reportedly celebrated this year’s Valentine’s Day with her girlfriends and children. Tori Spelling, 40, shared photos on her ediTORIal blog of how she’s been keeping busy crafting with her kids and partying with pals. “This year, I decided that I wanted to do something special for my girlfriends for Valentine’s Day. So, I invited my girls over to the house and threw an Asian inspired Valentine’s Day Tea!” Tori Spelling wrote on her blog earlier this week. 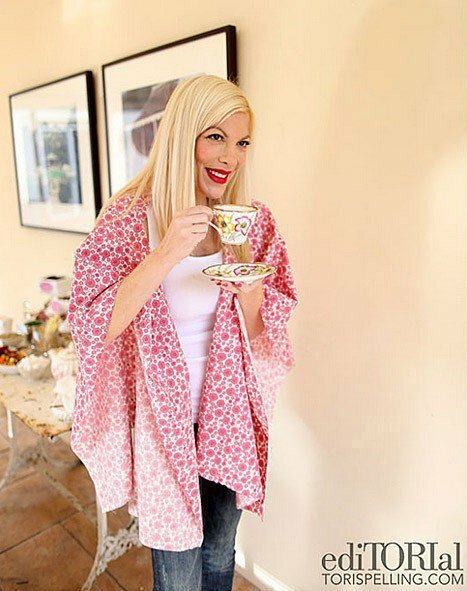 Tori Spelling shared a photo of herself looking festive and happy wearing a homemade pink kimono and sipping from a cute teacup. On February 14, Tori Spelling posted a blog about the sweet Valentine treats she made with her eldest children – Liam, 6, and Stella, 5 – for them to bring to school. “They made homemade party poppers – such a fun and easy craft that you can do with your kiddos,” she wrote. She also included a cute photo of Liam and Stella wearing red shirts and proudly showing off their party poppers. Tori Spelling appears to be in good spirits this holiday, despite the fact that husband Dean McDermott is currently seeking treatment in rehab.